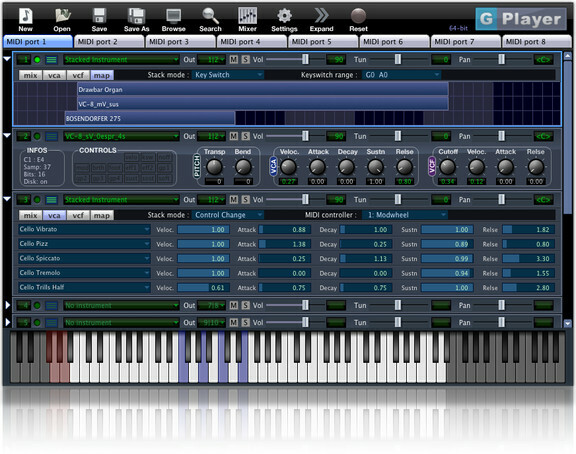 Soundlib has released version 2.1 of G-Player, a Gigastudio file player instrument for Windows and Mac. True stereo panning: A user can now precisely adjust the panning of the left and the right channels, or switch the left and the right side. The stereo balance has been kept for compatibility with the previous version. Increased the stack size from 16 to 24: a User can now stack up to 24 Giga instruments per MIDI channel. MIDI port mute buttons: In the standalone version a user can now mute each of the 8 MIDI ports. Direct sound loading: In the previous version, G-Player was loading a project asynchronously when running as a plugin. Some users reported occasional problems due to this way of loading giga files. This new version will load the Giga files immediately when opening the plug-in, which means that when a project is open, all the giga files are loaded and ready to play. Fixed the envelope segment modulation by a MIDI controller. For Mac users: This version is digitally signed, so it will install and run fine with GateKeeper. It has also been tested extensively on OS X Mavericks. The update is free for all existing users and can be downloaded from the user area at the Soundlib web site.